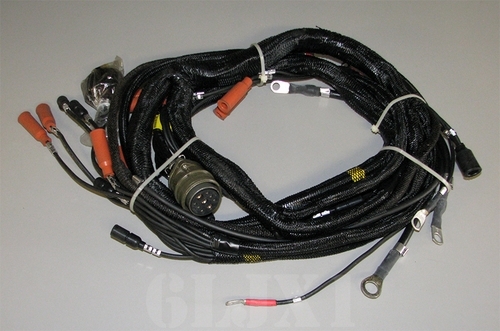 HMMWV basic and A1 versions 6.2L engine wire harness. P/N 12339350. (Rev G) NSN 5995011845545. Fits the M1097A1, M966A1, M998A1, M1038A1, M997A1, M1035A1, M1045A1, M1043A1, M1044A1, M1046A1, M996A1, M1025A1, M1026A1, M1097, M966, M998, M1038, M997, M996, M1025, M1026, M1035, M1037, M1045, M1043, M1044, M1046, M1042, M1121. Not for use on the M1113 / M1114 series Expanded Capacity Vehicle (ECV) which requires harness 6150014331568. Wire harness interconnects with glow plugs and glow plug controller, temp sensor, fan clutch timer, protective control box, various ground points, main body harness, trans kick down switch and solenoid, cold advance switch and solenoid, starter motor solenoid, alternator and alternator sensor, fan clutch temp switch, fuel solenoid, main DC feed from starter. All leads tagged/numbered. Factory original, mil-spec part. Made in USA.